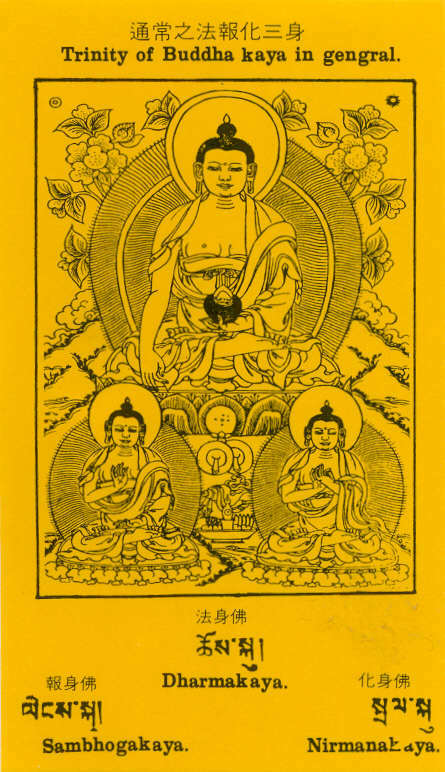 I earnestly dedicate this booklet to my benefactors, Adi Buddha, the God of Wealth Zambhala, and the Protector Damchin Dorjelegpa. When I meditated in the Yaoshan, it was foretold that I would migrate to India. After the end of the Second World War (1946) I received an invitation from Upasaka Huang Han Chu asking me to accompany him to India. As I foreknew that Mr. Huang would not stay long in India, I had thus considered in my mind, "After his departure who would support me to continue to meditate there?" 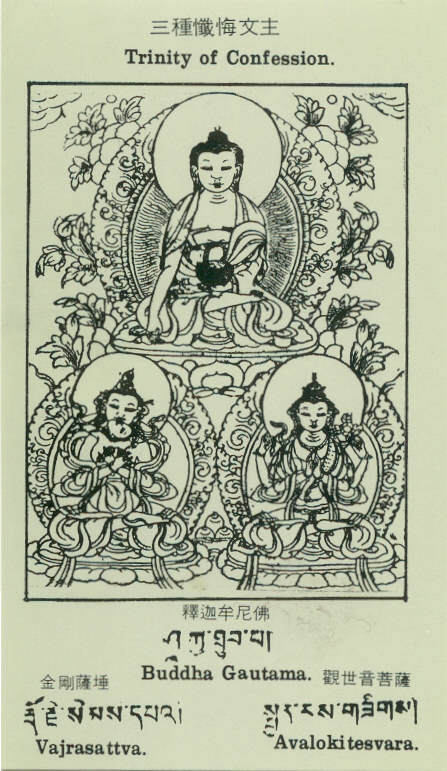 The answer of Buddha appeared at that time in the form of the picture of the Trinity of my particular benefactor. Now twenty-three years have passed and I have continued to live here as a hermit. All the help I've received has been by their favour. Hence I do know that the Trinity of Buddhism is quite different from that of Christianity. The latter lays most stress on personalities, the former on the function and not on their personalities which may or may not be equal in position. 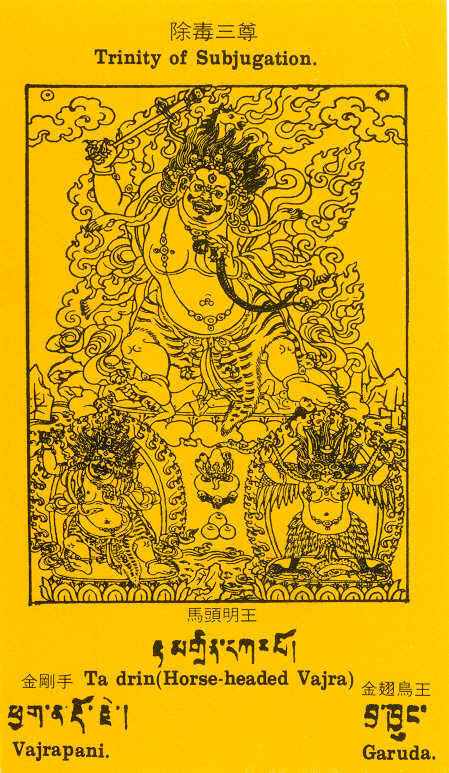 In this collection some Trinities are from the Tibetan traditions, while others are of my own conception. 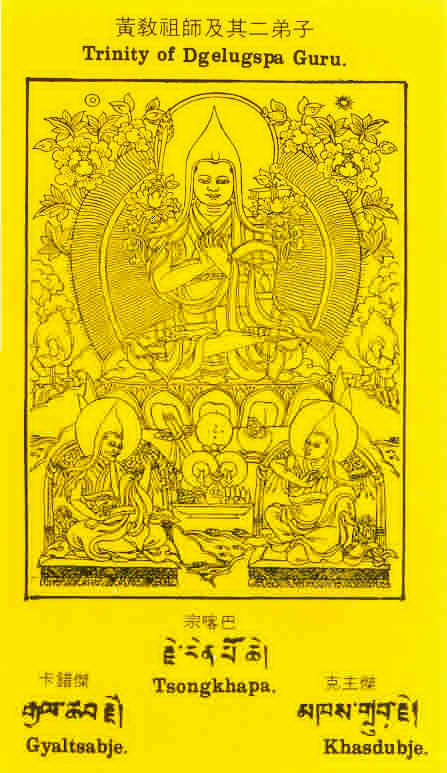 [IMAGE] May all my Samadhi be helped by Adi-Buddha and his Dakinis, all my spiritual needs be helped by the God of wealth and all my Holy Karmas be helped by Damchin-Dorjelegpa just as he helped our great Guru Padma Sambhava. [IMAGE] Oh! My great Guru you are the accumulation of the Holy lights of all Buddhas. Your two Holy Dakinis have the same achievement of non-death Yoga. May I be helped to similarly attain full Enlightenment through the practice of your rare and special Dharma. 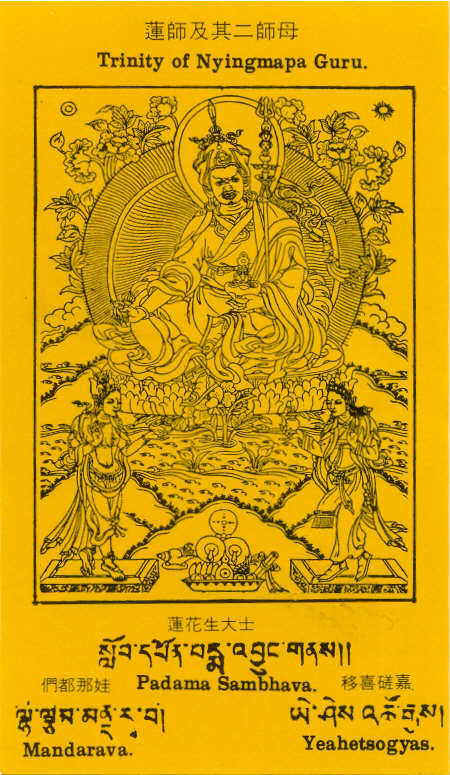 [IMAGE] As you were born in the Holy lights of Buddha Gautama, Amitabha and Avalokitesvara so your Trikaya are glorified as in this Holy picture. 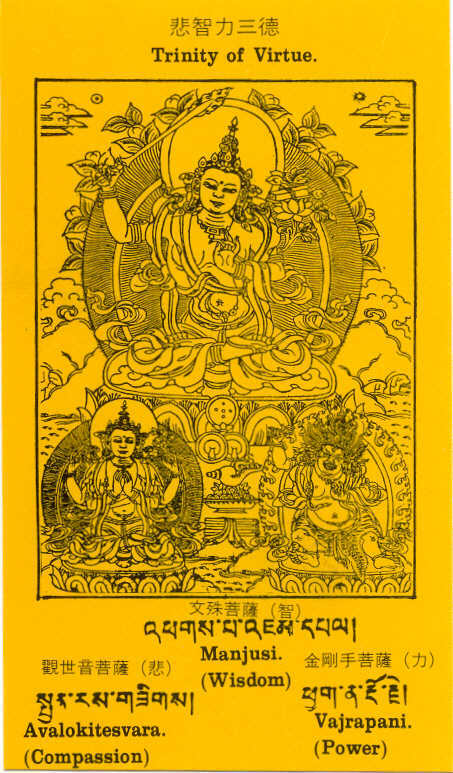 The Dharmakaya's light like Buddha Amitabha, the great mercy like Avalokitesvara, the great power like your Self, and all conditions forming the three kayas--May I be enabled to realize these attainments in this lifetime. 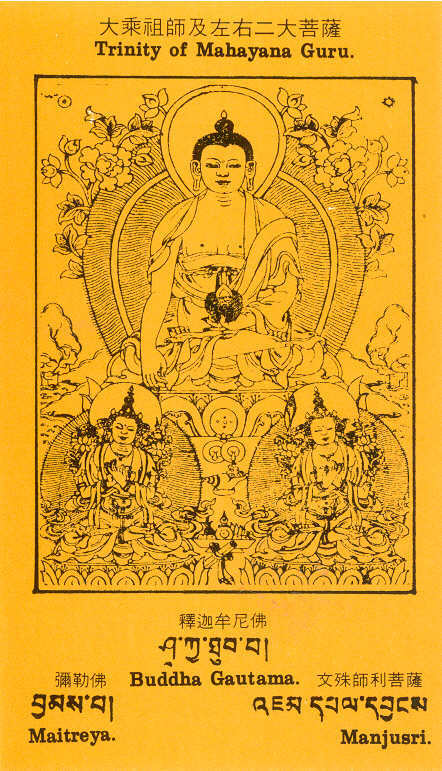 [IMAGE] May the identity of Vidya and Sunyata, that of Pleasure and Sunyata and that of great Compassion and Sunyata, forming the three Kayas of every Buddha, be collected by myself, thereby making possible the ultimate Salvation of all sentient beings. Only this is what I need. 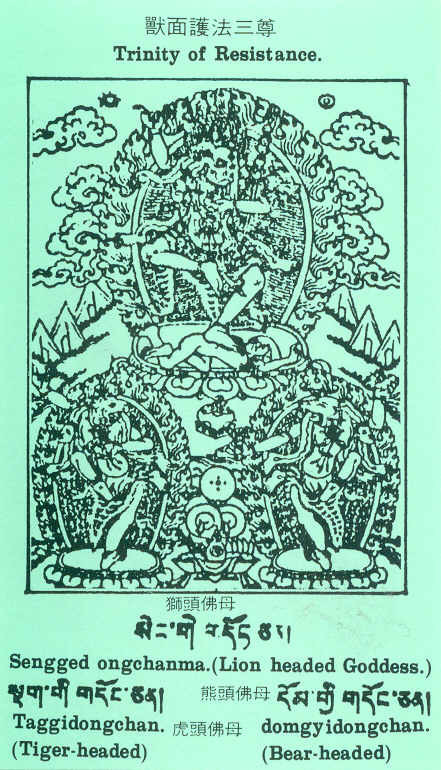 [IMAGE] Buddha Gautama's Mahayana has been promoted by the help of Mahabodhisattvas Manjusri and Maitreya. May the sunyata nature which is the source of Buddha's wisdom and the sunyata of conditionality which is the source of Buddha's Holy Karmas be possessed by myself the same as well as by you. 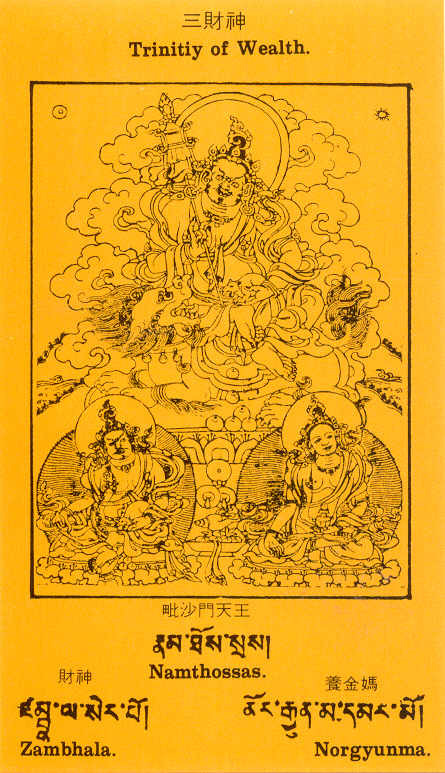 How wonderful this is that the three personalities are in oneness even with my self and this self is identical to the great sunyata--both in nature and in form, there is not a hair's difference between them. May all sentient beings who have this nature be quickly accumulating the conditionalities of Buddhahood. [IMAGE] Most difficult teaching which makes every Dharma of Mahayana and Vajrayana possible and fruitful is your personally natural instruction, conveyed not only through verbal lecture but actual performance as well. I earnestly worship you and request your great basic blessing to make me successful in the practice of impermanence, renunciation and the non-egoism of personality. [IMAGE] One Guru who possesses the virtues of Manjusri, Avalokitesvara and Vajrapani, who founded the latest tantric school, who lays most stress on Vinaya, Hinayana, and the Sunyata of Conditionality--it is only you who are able to guide the believers of this Kali age. May every sentient being be blessed! 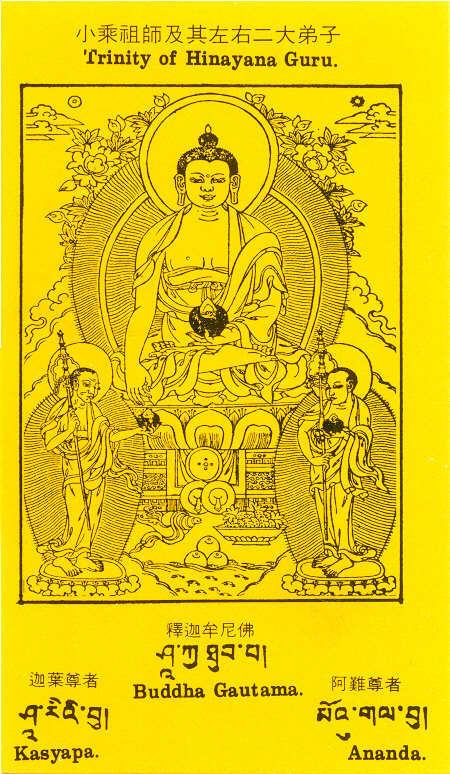 [IMAGE] So many Bodhisattvas have not attained full Enlightenment, so many outsiders have not been converted, so many evil persons have not become good, so many communists have not accepted religion, because of these my duty is so heavy. Please kindly favour me enough time to fulfill it. May my longevity unite with health, health with powers, and powers with the above holy Karmas. [IMAGE] Needing no long period of practice, no difficulty of visualization and realization, only by wearying of the five defilements of this saha world, by pursuing the pleasures of Sukhavati, and by reciting your Holy names, can one easily enroll in your Pure Land. It is very suitable practice for this kali age. Who would be so foolish as to neglect this and follow other ways? [IMAGE] The sins caused by my ignorance, may they be redeemed through the profound Philosophic Samadhi of Sunyata revealed by you--my Lord of Truth, Gautama--so I would attain gnostic wisdom without false views. 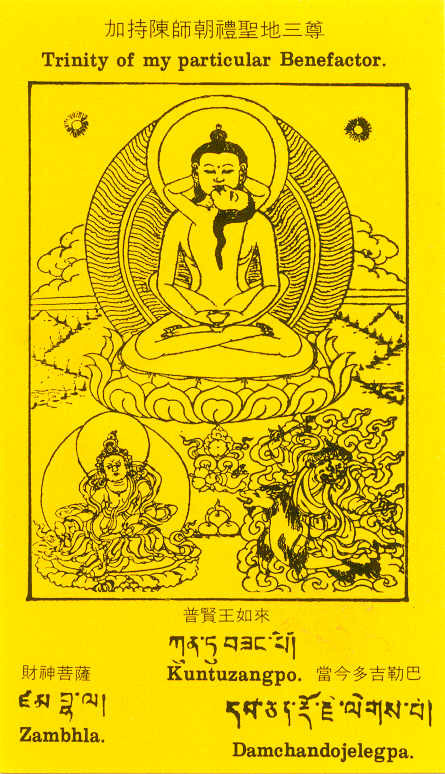 The sins caused by lust, may they be redeemed through the Vajra love practice exemplified by you--my Lord of Secrecy, Vajrasattva--so I would transcend all worldly desires. 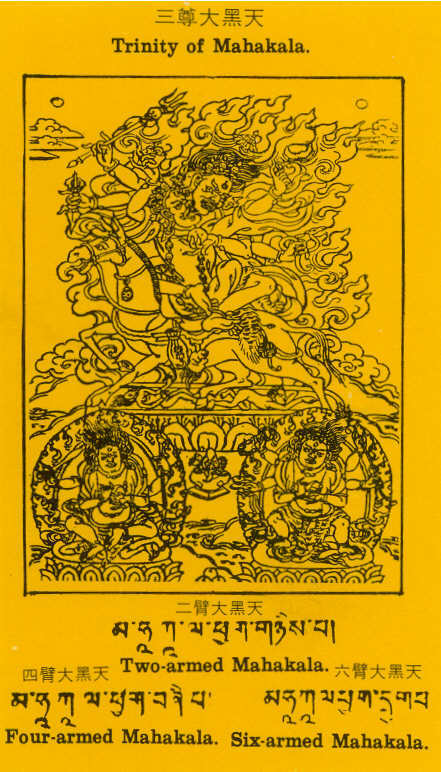 The sins caused by my anger, may they be redeemed through the Bodhicitta of conduct, personally taught by you--my Lord of great compassion, Avalokitesvara--so I would be able to save others. When all 97 inner evil drivers which drive me to run in the transmigration disappear after my purification of these three fundamental sins is done in this confession, longevity is in my hand but not Yama, Nirvana is my home but not Sukhavati, how happy I would be. O! Thanks to my Lords! 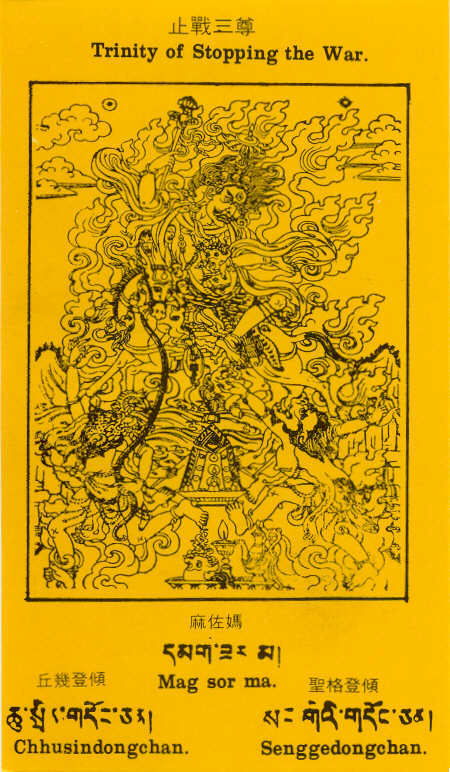 [IMAGE] The profound wisdom of Manjusri, the great compassion of Avalokitesvara, and the awesome powers of Vajrapani are the three virtues of salvation, so urgently needed during this kali age. May I accumulate all of them through my samadhi and your continuous blessing. 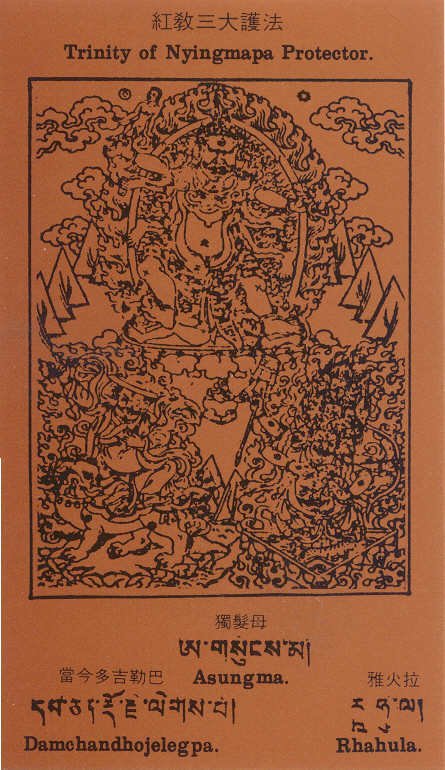 [IMAGE] Where there is narrow mind arising, my mother Tara, please help it to become as great as yours; where there is doubtful mind arising, my mother, "the Light of Buddha", please help it to become as bright as yours; where there is stingy mind arising, my mother, "the One-Hair Tufted", please help it to become as generous as yours. As for me as the one who has tried to sustain the non-mind continuously, may mine always be in yours, and yours in mine. 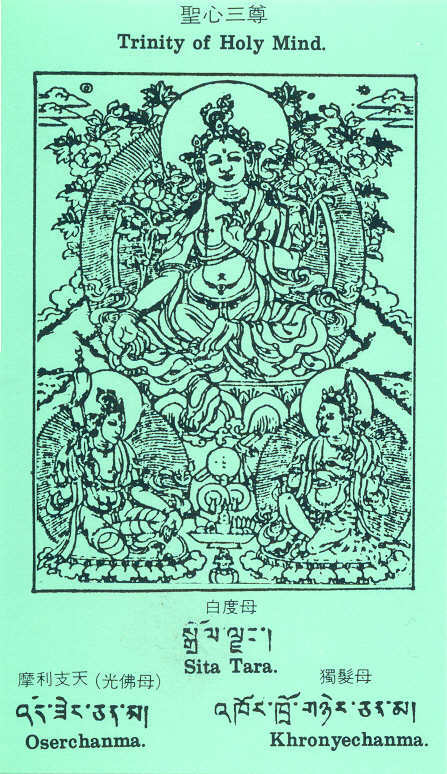 [IMAGE] Though poverty is a good condition for a practitioner, yet the vast propagation of Dharma, the magnificence of mandala construction, the printing of the voluminous Tripitaka, and its translations into various languages, and the offering of precious Homas--all these material things for the one who has non-egoism and non-selfishness should be granted by your blessing. For whatever is for the one serves the many. When he is helped, many kinds of Holy Karma flourish and many sentient beings are profited. Much more needed are the spiritual wealth such as Bodhi-citta, Sunyata realization, Holy light and Samadhi which are more important than the worldly property;please grant these by your blessing. May all practitioners have the merits to be so completely favoured. 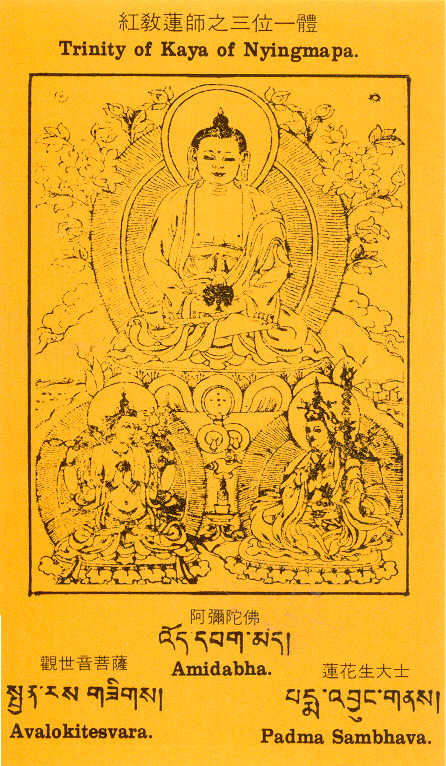 [IMAGE] Although Sa-Skya Pandita himself was blessed by you to be a national Guru of the Chinese Empire, we, the followers, do not have sufficient accomplishment of realization yet needing more souls to believe, more Holy Karmas to succeed, more outsiders to convert; without your help this is not possible. May your floral arrows and hooks attract all the Emperors, Presidents, National Chairman, Prime Ministers, riches, beauties, and believers, outsiders, and even evil persons to be under my feet. 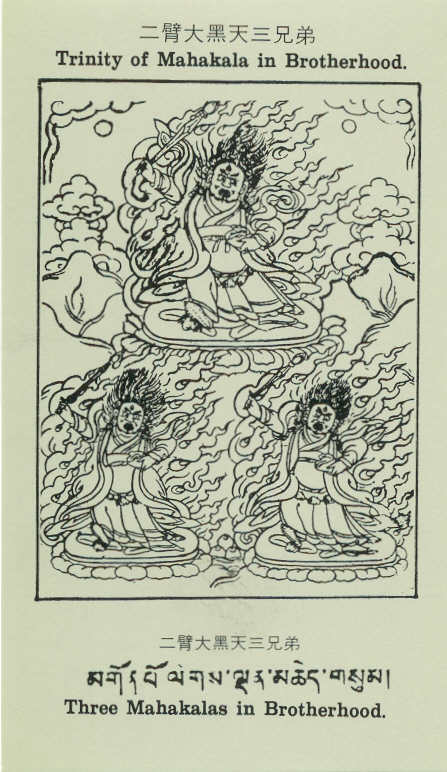 [IMAGE] The one with two arms is an incarnation of Adi Buddha who helped me to attain realization of the great perfection; the one with four arms is an incarnation of Samvara who helped me practise Vajra Love and brought Dakinis to my cave and hermitage; the one with six arms is an incarnation of Avalokitesvara who helped me personally receive the Great Mercy Incantation. May all practitioners be equally blessed by you--the undefeatable Mahakalas. 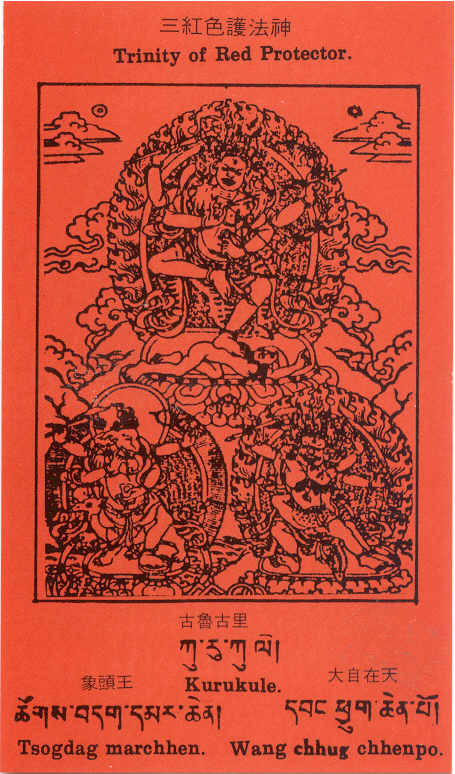 [IMAGE] The highest and most profound Dharma of the great perfection, the nine Tantric yanas, the Holy salvational Karma either gnostic or mundane were blessed by you for the whole School of Nyingmapa. May I, the follower of the great Guru Padma Sambhava, be aided by you just as well as you aided Him. As the youngest one gets more help from his parents than do all his elders, so please keep me in the realization and accompany me in the Holy Karmas. [IMAGE] Those outsiders probably curse me in their inner minds with a sweet smile outside; I might be harmed by them; except you, who knows? Forgive me if my hindrances were removed by you secretly but I was not aware of it. Help me dispel any motive which may cause the hate of outsiders and help me increase my non-egoism realization so there is no differentiation between inner and outer. O! my Ma, do stop the war! All men fall into desire! Who is the one you do admire? May I not be the only one, ah! My merciful Ma, stop the war!! [IMAGE] I'm so ignorant and unable to know how to make those Kings of some Dragons happy and how to dispel those conditions which would make them unhappy. If some dreaded diseases like leprosy, gonorrhea, ringworm, plague, or venereal disease would infect me or my patrons, my believers, and my friends, please kindly prevent it. If the infection is already present, please kindly cure it. May all those wicked Dragons be subdued by you. [IMAGE] When an ant carries some of my food to his nest, though it is a short distance to me, yet it takes the ant a long time; therefore, I help it by bringing the food to the hole of his nest and saving the ant's time and strength. So with tears I think of my path to Full Enlightenment and my work for reaching it. If it could be helped by you, the Holy Brothers, I would attain it very quickly and easily. Even all Buddhas are under the white umbrella of our mother--Sita Tara. You, the Holy Brothers, eventually work for our Mother, and would not allow the 404 kinds of diseases, eight great calamities, four demons and various wicked ghosts to be my obstacles on the way to Full Enlightenment. Please kindly do help me as I do the ant. [IMAGE] You helped in the cause position--lifting the Godly horse's four feet to bring our Lord Gautama from palace to forest; you helped in the course position--appearing on the walls of every monastery and hermitage, enabling all sages to succeed; you helped in the consequence position--lifting again the Godly horse's four feet to bring our great Guru Padma Sambhava from Tibet, where his salvational Karma finished, to the Yaksa realm to be the conqueror there. All forms a Trinity of periods and a Trinity of helpfulnesses. May I be blessed from above me, be guided from before me, be protected from behind me, and be lifted from under me.